I hope all is well, and I hope your week is going well. Here is what is new around the parish and beyond. The pictures above were from a church tour that I gave to the first graders in faith formation yesterday. It’s always great to show the children everything that we have in the church and hear their questions and to see everything through a child’s eyes, seeing everything fresh that we tend to take for granted. I also enjoyed speaking with both eighth grade classes in the evening about prayer. We have some great children and families in the parish. As you may already know, I take turns visiting the classrooms in faith formation and teach at least a portion of the class. Again, I’m so grateful to the wonderful teachers and volunteers that we have in faith formation and for Debbie Biegler and the work that she does there. Many of you continue to ask about the school addition project. As you know, there have been a number of delays on the bureaucratic side. The building inspector has asked us for additional information or forms and we have supplied them. We hope to begin breaking ground as soon as that is possible. We look forward to having the addition in our school, and I know it will be a blessing for our entire community. Thanks for your support and your patience. I will wait until this weekend to give you the updated numbers for the capital campaign, but thank you to all of those who have supported already. 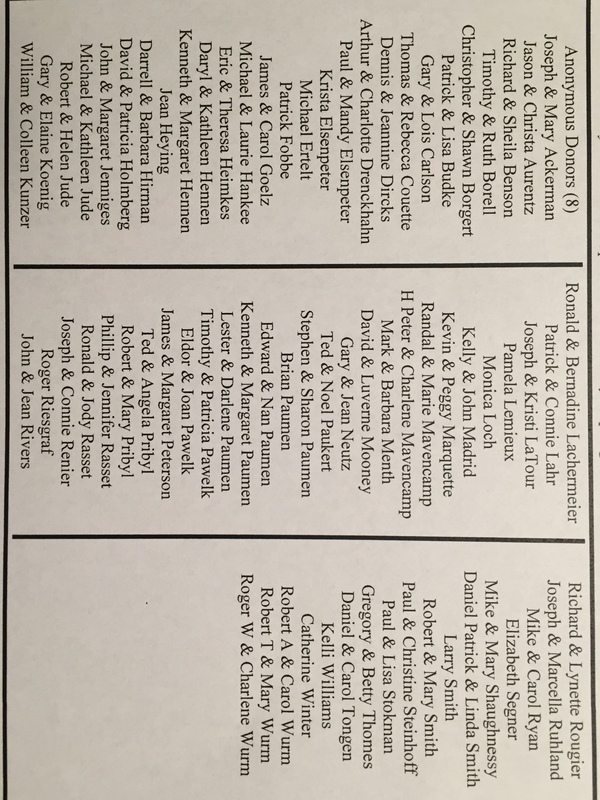 This is the latest list of names that will be included in the bulletin this weekend. As you can see, the list is growing. Thank you. We have the school Mass this morning. At Mass, we hear the Gospel, Jesus tell us that he came to set the world on fire and that he wished it were already blazing. May we have a faith and a love that sets our world on fire. Preparations are well underway for the lock-in on Friday night. Thank you again to all those who helped us reach the goal for our great school. Before the lock-in, however, the students will have a service day where they will help with yard clean-up and spend time with the elderly and home-bound. Since I know some of you have asked about it already, I’m sure you saw the latest news about our former pastor, Father Mark Huberty. Here is a link to the official Archdiocesan press release in case you missed it. Since I know little more than you do on the matter, I would just say that we pray, of course, for a just outcome and pray for all those involved. He is being temporarily removed from public ministry while the canonical process proceeds. There was enough evidence to support moving forward with this process and to remove him temporarily from ministry. Similar to a legal trial, it is saying that there is enough evidence to move forward with the process. However, there is no statement yet about guilt or innocence. As you know, Father Huberty was acquitted of the civil charges last year. The process now is to determine whether there was a serious offense committed under canon law, which is the law that governs the Church, independent of whether there were any civil convictions. I look forward, as I’m sure you all do, to hearing Deacon Ron preach this weekend. God bless. See you soon.